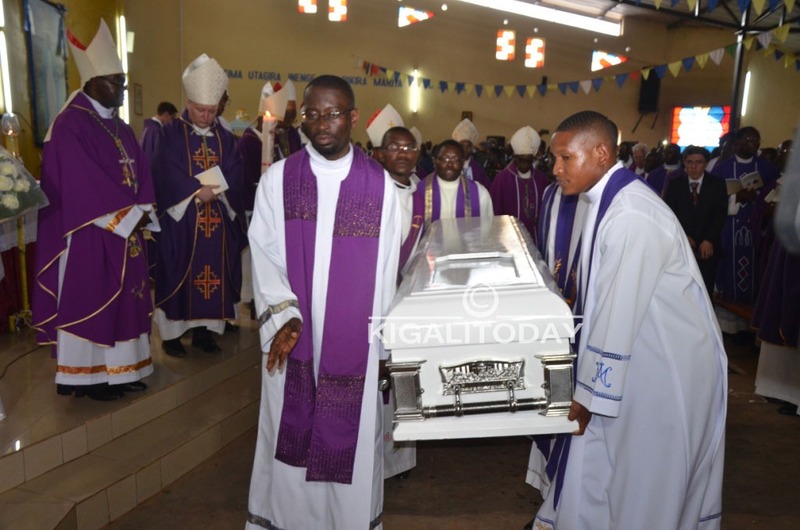 Late Bishop Bimenyimana was on Friday laid to rest with thousands of Rwandans bidding farewell to a man who spent 38 years selflessly building the Catholic community spiritually. A crowd of mourners walked, others drove from as far as Kigali and neighboring countries, some with wreaths, as early as 6AM to attend the requiem mass ceremony which took place in Cyangugu cathedral – Rusizi district, also the final resting place of the bishop. By 10am, the cathedral was full to capacity, as many citizens including children dressed in T-shirts bearing the late Bimenyimana’s face. Along with regular citizens, nuns and priests they continued flocking in at the cathedral venue dressed in white. Those who could not make it inside the cathedral on time, sat under the the sun to watch the live ceremony streamed on a wide screen operated by a private operator. 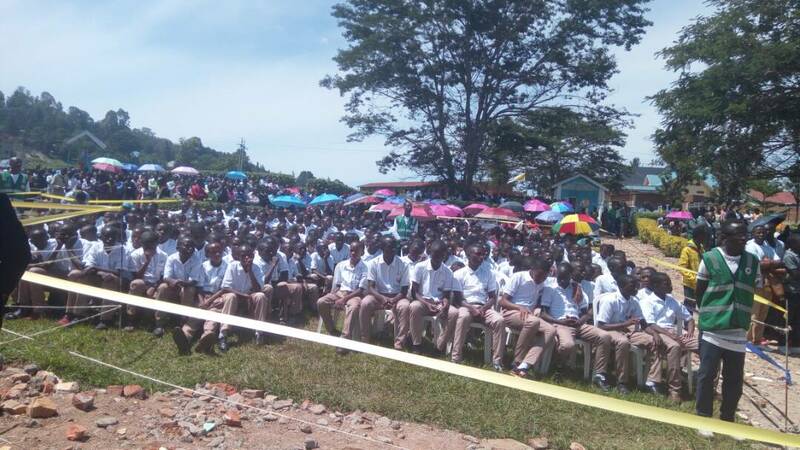 Others like students and pupils including non-Catholics sat with sorrow filled faces braving throughout the shiny Friday morning and afternoon, as most carried umbrellas of different colors. Others took shelter under thorny trees and shrubs around the cathedral grounds. Before bidding him farewell, Bishops who grew up with him said his zeal and love for God was outstanding and a challenge to some people including his fellow clerics. “I grew up and knew Bimenyimana from the time when we were recruited as seminarians. In 1994, we were hunted by Genocidaires and like me, he was on the list of wanted person, but he never gave up on his faith,” said Bishop Vincent Harorimana of Ruhengeri Diocese. After several years of battling cancer Bimenyimana succumbed to the deadly disease despite getting medical attention. 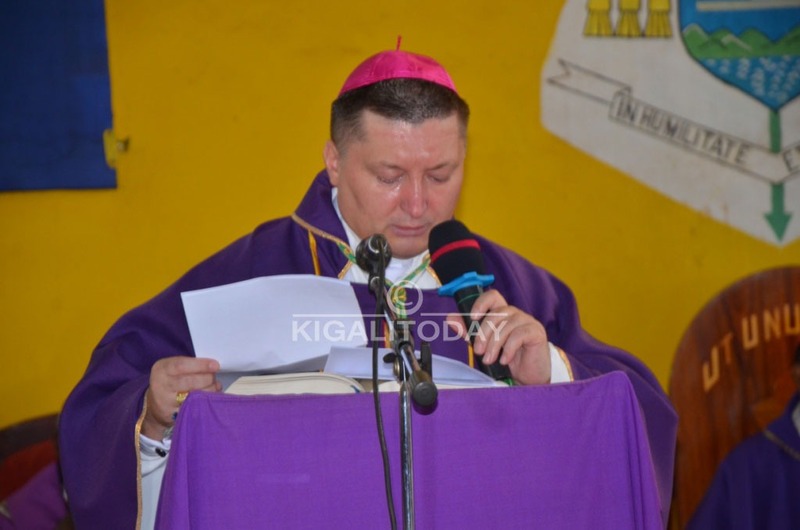 He died at Rwanda Military Hospital on Sunday March 11th– the same date on which Cardinal Karl Lehmann of Germany died. According to Bishop Harorimana, the deceased was at one point bedridden while in Europe and made one wish before his death. “He (Bimenyimana) said to me I cannot die in a foreign country and I don’t want my body to come back home in a casket. 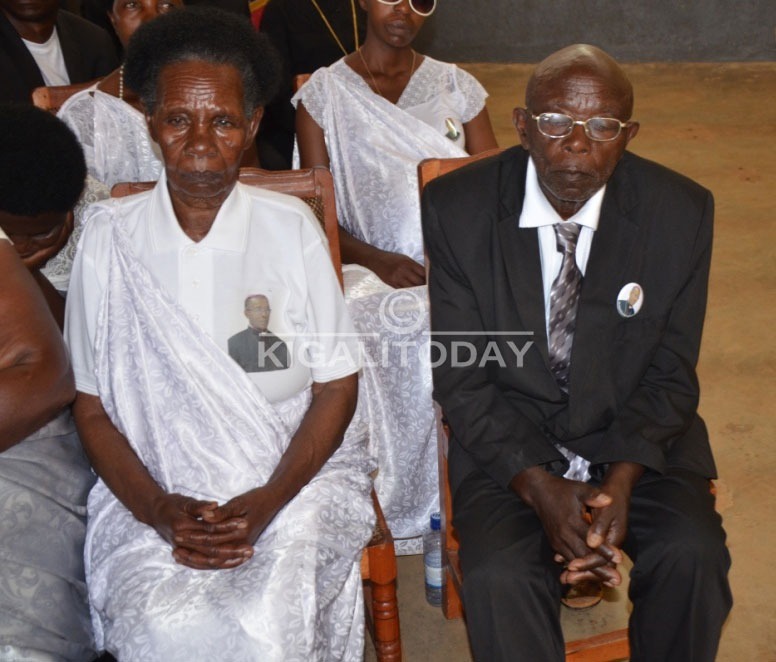 So he asked God to grant him one thing before he dies…to rest in his home country Rwanda,” Harorimana said. According to Smaragde Mbonyintege, Bishop of Kabgayi and Dominiques Nyiranzeyimana the young sister to the deceased, Bimenyimana’s resilience was endowed with the gift of hard work and love for God and others above self. “I was very young when he joined the seminary and ordained, but his humility was exemplary. At one point I tried to help him tie his shoes but he quickly stopped me and did it himself,” said Nyiranzeyimana –who was surrounded by family members. On the front row pews Bimenyimana’s mother and father (Maria Nyirakanazi and Augustin Hategekimana) who looked younger and stronger than their ages, sat looking on in a contemplation mood listening to testimonies about their son whose death compelled Pope Francis to send a special message of hope. “The Pope sends his heartfelt condolences and blessing to the soul of the deceased, to the family and the religious community gathered here to bid farewell to a servant of the church” said part of the papal message read by Andrzej Józwowicz- the Papal Nuncio to Rwanda. 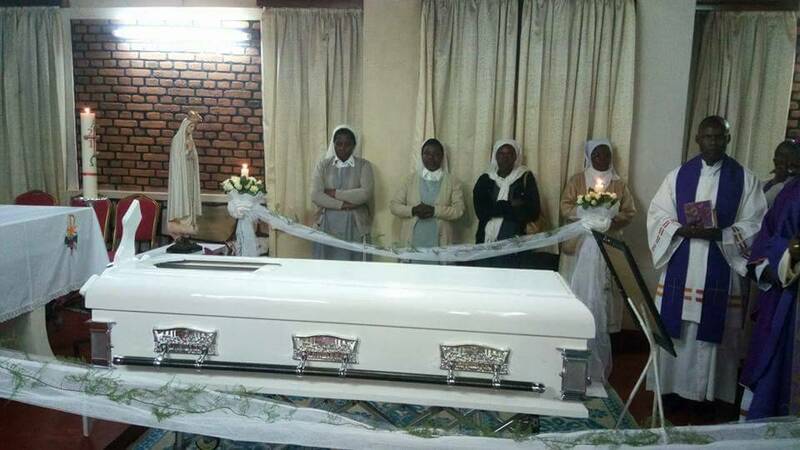 Laid in a white casket with roller tires and silver plated handles and wreaths of flowers under and on both sides, Bimenyimana’s body was viewed for the last time starting with his fellow catholic family and Christians. The event happened amidst sobering sounds and deep church funeral songs by Marie Reine choir that escorted mourners led by Bishop Philippe Rukamba of Butare and (President of Rwanda Episcopal Conference) to perform the funeral rites and procession which involved acts of incensing, blessing and anointing the body of the late bishop. As part of Catholic Tradition of burying bishops, the bishop was buried in accordance to the Canon law, teachings and practices of the church. Inside the left corner of the cathedral build a tomb was ready set for burial. Above the grave a bible verse inscription from Psalms 69 read: “for zeal for your house consumes me” and a statue of Mother Mary facing to church alter and the same direction as that of the head-side of the casket. 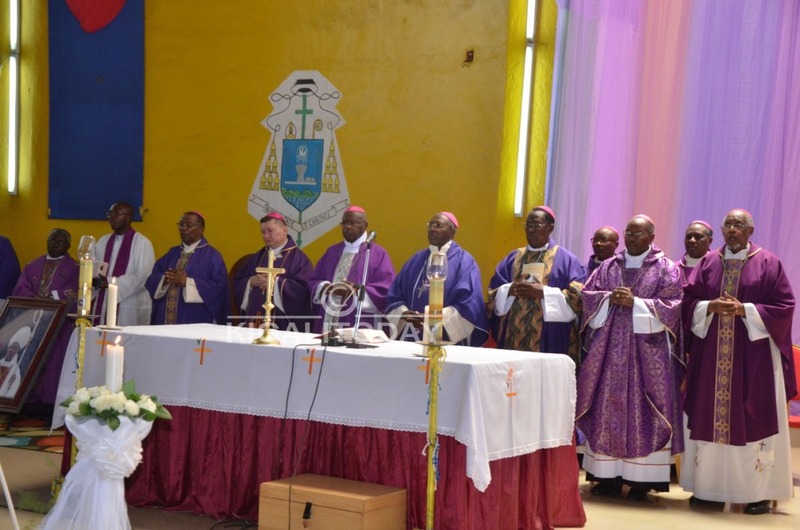 The funeral mass was also presided over by bishops:- Anaclet Mwumvaneza of Nyundo, Celestin Hakizimana of Gikongoro, Servelien Nzakamwita of Byumba, Antoine Kambanda of Kibungo and Alexis Habiyambere, and many other bishops from Burundi, DR Congo and Uganda, alongside leaders of other Rwanda religious denominations and government officials. Bishop Bimenyimana was born on June 22, 1953, in Bumazi; Shangi Parish, Cyangugu Diocese. In January 1997, at the age of 44, he was ordained Bishop of Cyangugu Diocese which covers a big part of western Rwanda.